SpaceX released video of the “propulsive hover test” of its SuperDraco thrusters, designed for “helicopter precision” landing of a spacecraft. During the test, the Dragon 2 capsule hovered in midair for five seconds, lifted by the force of eight thrusters. In the video demonstrating the test, conducted last November, the Dragon 2 capsule can be seen suspended from a cable at the company’s test facility in McGregor, Texas. A few seconds later, all eight thrusters fire and lift the machine up to make it hover for roughly five seconds. “SpaceX recently tested its ability to fire engines that will be used to land a human-rated spacecraft safely on the ground with the accuracy of a helicopter at the company’s test facility in McGregor, Texas,” NASA said in its blog. The SuperDraco thrusters are positioned equally around the Dragon 2 capsule in four pairs. The engines are built into the side walls of the spacecraft and can produce up to 120,000 pounds of thrust for ultimate maneuvering. SuperDraco is a hypergolic propellant liquid rocket engine that uses a storable propellant that theoretically enables the engine to be fired many months after fueling and launch. The engine chamber is produced via 3D printing of Inconel, a high-performance superalloy, through a method known as direct metal laser sintering (DMLS). “Through 3D printing, robust and high-performing engine parts can be created at a fraction of the cost and time of traditional manufacturing methods,” Elon Musk, SpaceX CEO, was quoted as saying. The use of such engines aims to slow the descent of a spacecraft and land the capsule down on the launch pad without any parachutes. The entire program is being developed with NASA’s Commercial Crew Program. 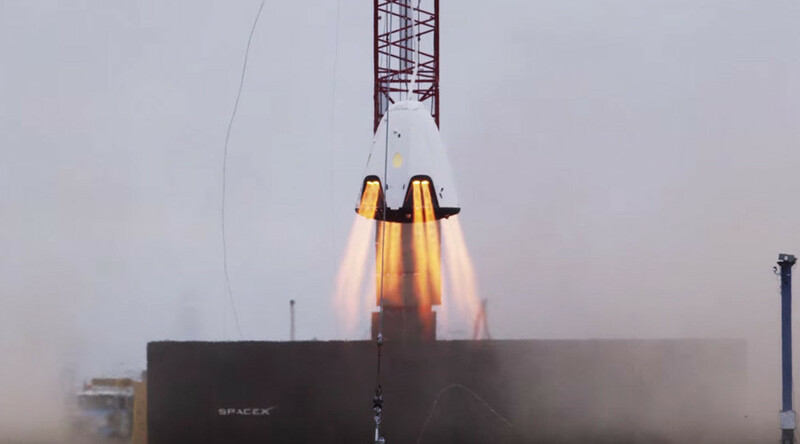 NASA says that SpaceX is in the “early phases of analysis” after conducting two “tethered tests of a full-size Crew Dragon mock-up” in November, which tested and refined the landing software and systems of the capsule.